A substance can describe any kind of chemical that, when used (eaten, smoked, swallowed, injected, etc.) causes some kind of biological or chemical reaction in the body/brain. Substance use can be complicated, because it describes any time a person uses any kind of substance, regardless of whether it’s legal or not, the amount that is used, who is using it or how often it’s used. That means we can be talking about anything from smoking a cigarette, to taking a pill, to getting drunk at a bar, to having your daily morning coffee. All of those activities are about using a chemical in order to get some of body/brain reaction. Other terms you might see are: “substance abuse”, “substance misuse” or “addiction”. Sometimes people use these terms as if they all mean the same thing, which isn’t the case. 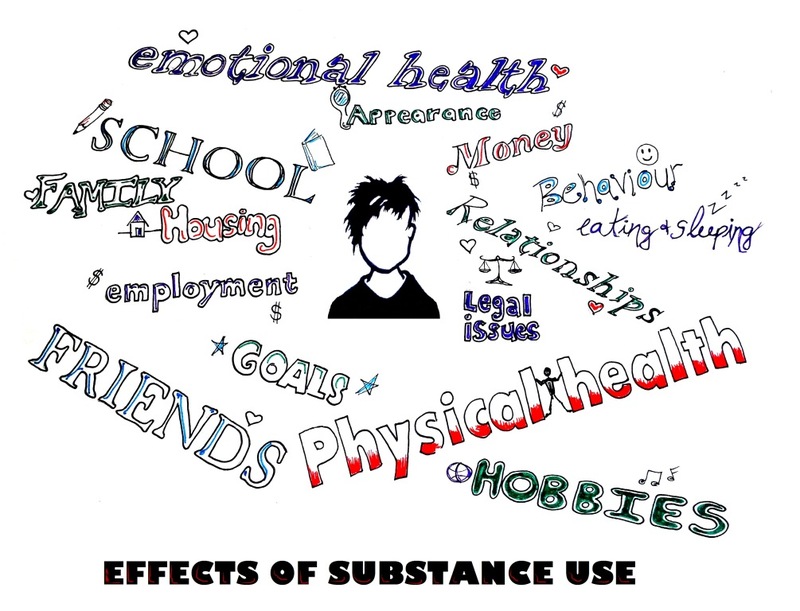 Use of a substance may not be the same thing as “misuse” or “abuse”. “Abusing” or “misusing” a substance is not necessarily the same thing as having dependence and addiction. 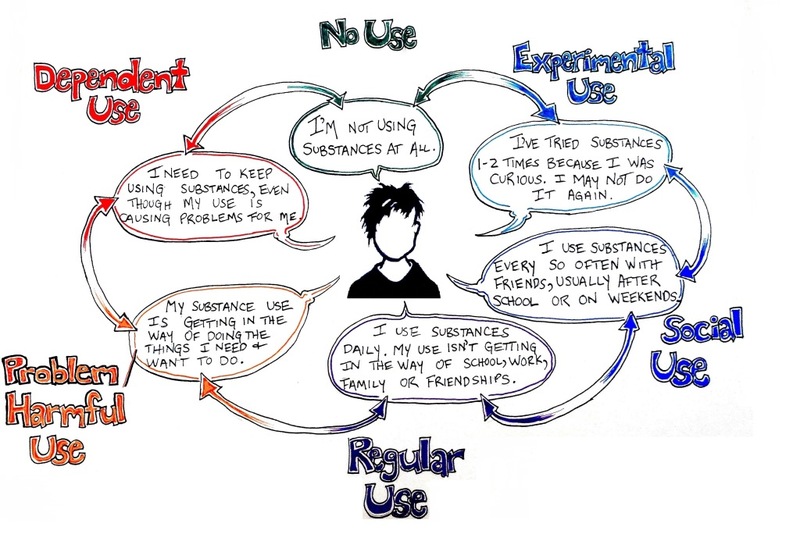 Understanding substance use can be complicated. People and their behaviours don’t usually fit neatly into a “category”. The world is not divided into people who don’t use vs. addicts. Instead, it might help to look at substance use as a “spectrum” or sliding scale (see image in slideshow). Stimulants: These types of substances may temporarily increase a person’s alertness, attention and/or energy. Example: caffeine, cocaine, methamphetamines, etc. Hallucinogens: These are substances that can temporarily change the way people see, hear, taste, smell or feel, and affect mood and thought. At high doses, all may cause a person to hallucinate, or see, hear or feel things that aren’t really there. Example: LSD, Ecstasy, Salvia, etc. Depressants: These types of substances cantemporarily make people feel relaxed, less tense, and less aware of what is going on around them. Example: Alcohol, heroin, prescription painkillers (Oxycodone, Fentanyl), etc. Substance use can also affect other parts of a person’s life beyond just their physical health, especially if it becomes problematic. If someone's substance use becomes a problem, it can get in the way of relationships, meeting goals, hobbies, school, work, emotional health, etc. (see the image above in the gallery). What would be some signs that a person’s substance use was becoming problematic? Here are a few things to look for in yourself or a friend that might indicate that it’s time to get help. Not doing activities once enjoyed. Moodiness, anxiety, angry outbursts, giddiness or hyperactivity. Changes in eating and/or sleeping patterns. Leaving old friend group to hang out with new friends who also use substances. Using substances very regularly and/or to excess. Trouble attending school or work. Changes in appearance or level of self-care. Physical symptoms (tooth decay, sores in nose/mouth, breathing/coughing issues, marks/sores, weight loss or gain, etc.). Irritable, ill or feeling withdrawal when not using substances. Needing to use greater amounts or use more often to feel high. Life seems to revolve around using or getting substances. Substance use continues despite getting into trouble with the law, or at school, home or work. If you’re going to be using substances or you are around others who are using, it’s good to know what the signs and symptoms are of overdose. If overdose is suspected, call 911 immediately. Reactions to substances are going to not only differ from person to person, but also will differ based on what type of substances are being taken. An overdose from cocaine may look and feel a lot different than an overdose from alcohol, for instance. Signs of distress or overdose vary widely depending on the type of substance being used. A person does not need to have all of these symptoms when an overdose is happening. Myth: Using drugs regularly or in excess means you are an “addict”. Fact: Substance use is a lot more complicated than that. The world is not divided into “those who don’t use” and “addicts”. Drug issues are not measured by what the drug is, how much or how often it’s being used. It’s more helpful to think of substance in terms of how it's affecting your health and life. If using substances is hurting your body or getting in the way of things you enjoy or are necessary in your life, then it’s problematic. If you’re finding it hard to stop, even when you know it’s affecting your life, it could be considered “dependant use” or addiction. Myth: I have a pretty good idea of how a substance is going to affect me, because I have seen my friends do it all the time. Fact: Basing your substance use choices on your friends and their experiences is pretty risky. Substances differ so widely, even from dose to dose. Bodies and brains differ from person to person. You could have 5 people all drink the same amount of alcohol, for instance, and they may all react and behave differently because of their size, tolerance, how much they ate that day, their life experiences, their mood or underlying mental physical health issues. Even if you’ve used something regularly before, it doesn’t mean it’s going to affect you or your friends the same way every time. When you mix substances, that can change everything and results are even more unpredictable. Myth: Marijuana is totally fine, and you can’t get “addicted” to it. It even helps with anxiety. Fact: Marijuana has proved to be helpful for some when used to treat certain health issues, and some people can use it with no issues or signs of dependence. However, it differs from person to person. For example, for some people, it relaxes them, while for others, it can increase anxiety substantially. Many young people who seek help for substance use issues point to marijuana as being the main reason that brought them there. There is a strong and growing body of evidence that regular use of marijuana with teenagers can seriously harm the developing brain. Early regular use is associated with low academic achievement, not feeling good about life or feeling dissatisfied, higher likelihood of developing marijuana use disorder, and increased risk of developing mental health problems. Several studies have suggested that cannabis use before the age of 18 increases the risk of developing schizophrenia. Myth: Drugs used by previous generations were way stronger. Fact: Today’s drugs are much more potent (and therefore more addictive) than the drugs of previous generations – some are up to 70% more potent. There are also drugs around now that weren’t around when our parents were young. Myth: Teenagers are too young to develop a substance use issue. Fact: Substance use can become a problem at any age. Even unborn children can get addicted because of their mother’s drug use. Some people can develop an issue, have an overdose or other immediate and dangerous health issue regardless of how many times a substance is used or who is using it. Myth: I can try drugs just once and then stop. Fact: This might be true. Many people use substances once or a few times and then move on without issue. However, every person who has ever developed an issue with substances started the same way. No one develops a substance use issue or addiction on purpose. It always starts with “just trying” stuff and develops from there, and some substances are more addictive than others. All sorts of complicated factors can affect who develops and dependence on substances and who doesn’t. It’s impossible to tell where substance use will take you or how it might develop. Myth: Developing a tolerance to alcohol is a good thing. Fact: If you feel nothing after several drinks, that can be an indication that there is a problem. Many people who use substances regularly build up a tolerance, which means they need more and more to get the desired result. For example: A casual drinker wouldn’t be able to finish a couple of six-packs – and if they did, they’d feel very sick. If you’re drinking this much and feeling “fine”, it could be a strong indication that you need to slow down or seek help. Myth: Using prescription medications to get high is safer than using illicit/illegal drugs. Fact: Prescription medications are just as dangerous and addictive as other drugs. Opiates (prescription painkillers like Oxycontin or Fentanyl) are a good example of prescription medications that are highly addictive and extremely dangerous. Using these drugs can stop your heart, your breathing or both. Research shows that students who take prescription drugs for non-medical reasons are at least five times more likely to develop a substance use issue than those who don’t (McCabe, 2008). Myth: Taking medication prescribed by a doctor isn’t dangerous and isn’t really substance use. Fact: Sometimes people start off taking medication prescribed by a doctor in order to deal with a medical issue and then begin taking that medication too much, too often or for reasons outside of what it is intended for. This behaviour is called “substance use/misuse” or “substance abuse”. Medications are still substances, and have the potential to become problematic and dangerous if misused. Mixing prescription meds with any other substances without being aware of potential side effects is always a bad idea. Follow your doctor’s orders carefully, and don’t keep secrets from your doctor about drugs you have taken/are currently taking. Substance use issues are treatable. For problematic substance use, addiction, or any other mental health concern, if signs or symptoms are interfering with your life in any way, it’s time to seek help. Some substances are potentially life-threatening whether a person has used them a lot or only once. You don’t need to wait until things get really “bad” before you seek help. If a person’s pattern of using substances is interfering with physical health, relationships, and/or the ability to live a comfortable life, it’s time to talk to someone. That someone could be a friend you trust, a teacher, your family doctor, a crisis line, or counsellor. If it is a friend you are concerned about, they may resist help or not even recognize that they need it. They might need you to make the first step. See the support section for how to begin this process. As always, if you feel like your friend might hurt themself or someone else, it’s time to call emergency services. Some feel reluctant to call emergency services when substance use is involved for fear of getting in trouble with the police. It is important to call 911 if you suspect someone is having an overdose, regardless of who is there or what is going on. Police rarely show up for medical emergencies unless someone has requested them to be there (in case of death or if paramedics feel threatened). Even if police do come, it is important to get someone help immediately if you suspect overdose. Permanent brain damage or death can be the result of an overdose. People who seek treatment for substance use that is concerning to them or causing problems in their life can do so in a number of ways. Treatment for substance use might be geared toward what a person's goals are. For some, the goal may be to completely stop using substances altogether, and for others a more gradual approach is needed to help people decrease their use bit by bit. Substance use can also be complicated by other mental health concerns. Treatment strategies may also include addressing these issues as well as the substance use issue. Family members of someone who has a problem with substance use may participate in therapy or support groups, or benefit from learning about it and ways to support their loved one at home. A person living with a substance use issue, like any other person, will benefit from maintaining wellness and having good supports in their life. The fact is that any time you are using substances, it is risky. Every time you use it affects your body and your brain in some way, and being high or drunk can seriously impair good judgement. There is no “perfectly safe” substance use. However, if you know you or your friends are going to be using substances, there are things you can do make things safer. Put the numbers of a safe ride home, Poison Control, emergency services and/or a helpful person you could reach out to into your phone or pocket. Do this BEFORE you go out and start using. Tell someone where you’re going to be and who you are with. Make plans to be home at a certain time and have a safe way to get there. Know what the signs of overdose look like and make sure your friends know how also. Know how to put someone into the recovery position and make sure your friends know how also. To help you think more about how to plan ahead for safer substance use, use the Getting High tool. The information on Trip! Project also may also help you plan ahead for safer substance use. Trying to support someone that is using substances in a way that is problematic can be challenging. Learn about substance use, and the signs that might indicate that it is becoming a problem. A lot of social situations might include drugs and alcohol. If you think your friend is struggling with substance use issues, hang out with them in a drug-free environment and help them to avoid situations that would trigger substance use. You may think your friend's substance use is risky or problematic, but they might not see it that way. If you are really worried about it speak up and let them know that you care about them and want to be supportive. ○ Wait for a time when they are not high or drunk. ○ Pick a place and time that is calm and neutral to talk with them. ○ Be prepared to give solid examples as to why you are concerned about their substance use. ○ Come prepared with some suggestions of resources for them. ○ If you are willing or able, decide to stop putting yourself into situations where you are normalizing or enabling your friend's substance use. ○ If you feel comfortable, talk to an adult you trust or find helpful, or other people in your friend’s life who are concerned for some support. Even if you've used drugs with this person, it’s still ok for you to say something. Not everyone experiences substance use the same way, and some may be more likely to develop a problematic substance use issue than others. Be prepared to stop enabling behaviour. This means not “helping” them to live comfortably with a substance use issue. Example: Don’t cover for them at school or work, don’t give them money to buy substances, don’t participate in substance use with them, etc. This is harder than it sounds, but may be necessary in order to help your friend get better. If you have been hurt, inconvenienced or put at risk because of someone else's substance use, you might feel angry or frustrated with them. It's good to acknowledge that, but speak to them only if you feel calm and ready. Treatment is a process. Relapse is common. Be aware of this and try to be supportive as your friend adjusts. Sometimes, if the situation is becoming unhealthy for you, it’s okay to walk away. You are under no obligation to “save” your friend or continue trying to help them if they are resistant, hostile or affecting your ability to live your own life. You can be supportive, but in the end, you can’t make someone’s decisions for them, and you need to put your health and safety first. Getting High: A safety planning tool you can use to get thinking about using substances safely. Everyone Drinks: A blog by Tommy about recovery in a world where social drinking is the norm.